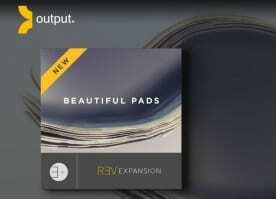 Output, the makers of REV, Signal and Exhale Kontakt instruments, have released their first effect plugin. “Movement” is a rhythm processor designed to add textural motion and tempo-driven elements such as oscillation, chop and modulation to your signal. 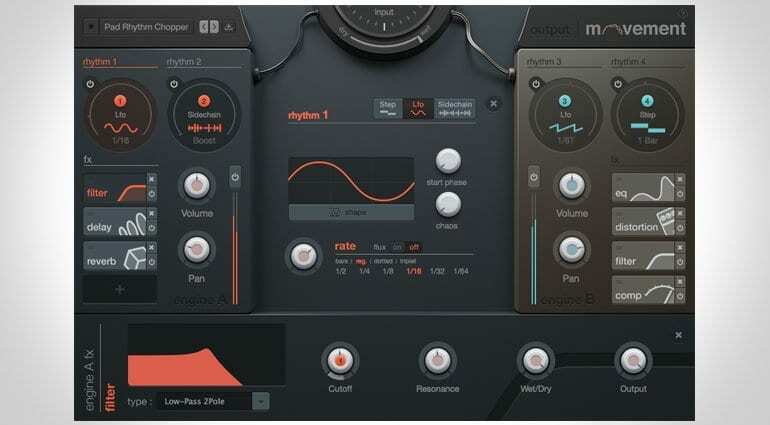 Movement uses 4 “rhythm engines” (which are essentially modulation sources) each of which can be set to use an LFO, step sequencer or an external signal fed into a sidechain. 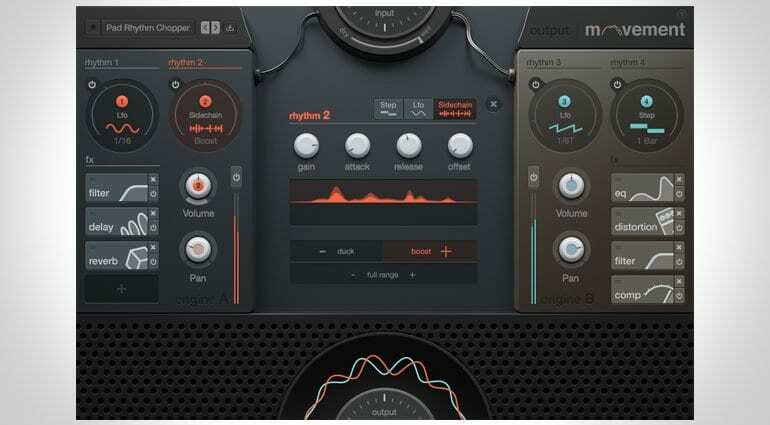 These 4 rhythm engines are split between two effects engines – engine A and engine B, in which you can have up to 4 inserted effects. The input signal is duplicated and routed through the 2 effects engines and combined at the other end. Each rhythm engine can be used to modulate any of a number of parameters within its effects engine by dragging it onto a knob. That sounds a lot more complicated that it is – basically you’ve got 2 lots of 2 modulators on 2 banks of 4 effects. Got it? You can assign an LFO to rhythm 1 and drag it to modulate the pan control for some dizziness. Assign a step sequencer to rhythm 2 and drag it onto the volume knob for a nice bit of chop. Drop a delay into effects engine B and map an LFO from rhythm 3 to the feedback knob and very soon your signal is a mess of movement and modulation. Click on a rhythm engine to view and edit its settings, choice of modulator and whether or not to enable “Flux”. Flux (also known as the bonkers switch) is a method of modulating the rate of one rhythm engine with the rate of another which tends to generate a sort of madly fluctuating rhythm that’s great for interesting effects. 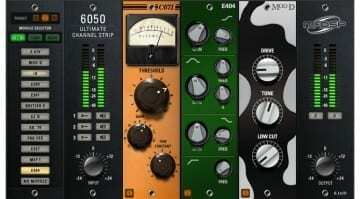 The insert effects on offer are delay, filter, reverb, EQ, compression and distortion. Each gets laid out with a bunch of controls along the bottom. Because you can do everything twice (engines A and B) there’s loads of room for creativity and madness. 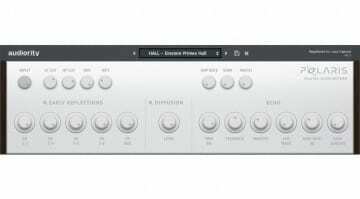 You can modulate the same reverb in two different ways, or have delay taps competing and phasing with each other, or have distortion on one engine and clean signal going through a reverb on the other – there’s lots of creative possibilities in here. Movement can work from the subtle to the extreme, being a simple delay or reverb for guitar through to making space noises and impossible reflections of modulating textures from you voice or synth sounds. There’s certainly fun to be had. 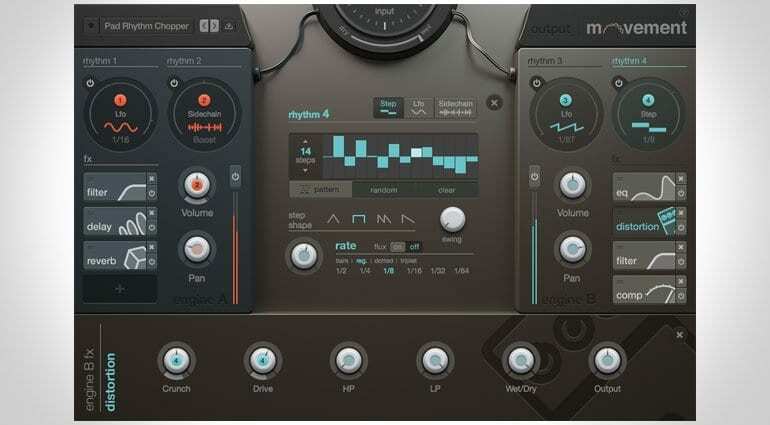 The interface, as with all Output products, is simply gorgeous and the layout and design make it totally dreamy to use. There’s a great selection of step patterns to choose from and LFO waves and both are displayed as graphics rather than just text in a list. With the current version I’m playing with on Windows 10 the text for many of the controls is all messed up – some kind of bug I imagine – so I can’t actually see what any of the knobs are, however, it’s a testament to the ease of use in Movement that I’m finding that it doesn’t really matter and the knobs become obvious once you start to play. What’s not so good is the screwed up text in the preset list – the presets seem to exist and I can select them and the patch changes but I have no idea what they are called. Hopefully Output will get this sorted. #Update: I got in contact with Output about the text issue and they say it’s to do with a missing font and directed me to download a free Helvetica font, which I did and now it works! It’s a common font and most people would have it on their systems, it’s just that my system is very new. They are working on a permanent fix but if you encounter this problem you can download a free Helvetica font from here. Lastly, in the middle of the GUI is a nice big XY pad which acts as a macro controller. You can assign any knobs you want to it by a simple right-click which reveals a panel where you can set the parameter range. This is of course enormously fun to play with. All the controls are very touchable and respond to multi-touch on a touch screen – nice. Output go to great lengths to make themselves sound interesting and innovative and this often gives an impression of complexity when actually their products are pretty simple, which is a strength in my opinion. 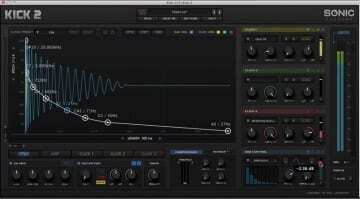 Movement is simply a multi-effects plugin that focuses on modulation. It’s not unique but it’s easy to use and encourages you to explore sonically, bringing some very interesting and enjoyable results. More information on the Output Movement product page.